"EAT + THINK + DRINK." This was how a group of young Filipino American social innovation junkies called NextDayBetter described what's in store for the "next generation" Filipinos in America - born and raised in the U.S. - when they attend the first ever TFC Speaker Salon on August 9, this Saturday, from 2:00pm to 5:00pm at the Children's Creativity Museum Theater in Yerba Buena Gardens in San Francisco. That day happens to be the first day of the 21st Pistahan Parade & Festival, the largest annual, free admission, two-day Filipino cultural event in the U.S. TFC Speaker Salon powered by NextDayBetter was launched as a Pistahan Legacy Project last July 22 at the Pistahan Community Kick-Off in San Francisco City Hall by 2014 Hermana Mayor, ABS-CBN North America Managing Director Olivia De Jesus. 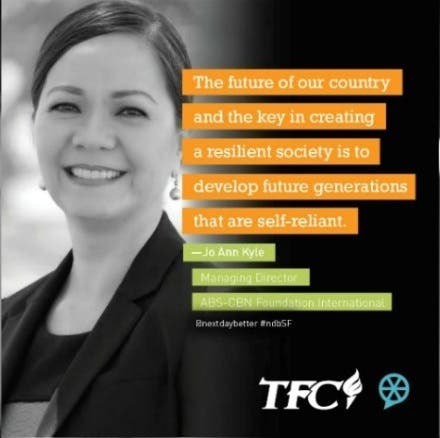 True to her word, TFC tapped partner NextDayBetter, defined by Chief Builder Ryan Letada as a culture platform that builds and activates diaspora communities “literally to make the next day better”, to gather a powerhouse line-up of speakers plus a celebrated chef and a “flanista” to create a FilAm-flavored environment where participants can “EAT + THINK + DRINK.” These make the TALK part much more engaging and fun. 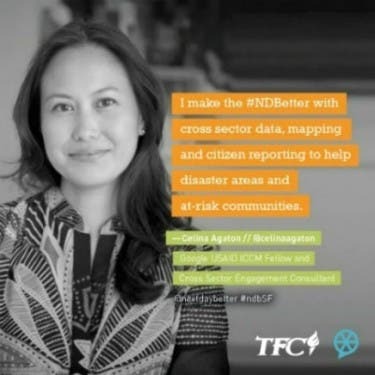 CELINA AGATON – a Google and USAID Fellow for the 2013 International Conference on Crisis Mapping, she is currently working on relief efforts and on a citizen reporting platform to track aid delivery for Philippine Typhoon Yolanda/Haiyan victims. In Canada, she is developing a cross sector program to support arts and innovation programming in priority neighborhoods. She has lived in Jakarta, Manila and Toronto. JO ANN KYLE – the Managing Director of ABS-CBN Foundation International (AFI), she was key in mobilizing the global community to raise funds for the survivors of Haiyan. Leveraging TV, social media, and community/corporate partnerships, AFI under her collected more than $3 million worth of medical supplies and MREs, and $3.5 million in cash in three months. With a needs assessment in place, the global funds now support two high impact sectoral projects – education – specifically building schools and livelihood projects such as provision of fishing boats and gears, and the development of ecotourism in Samar and Leyte. JULIUS PARAS – the Founder and Principal Consultant of Gumption Studios, LLC, he looks at the potential of people to lead bold, innovative projects to effect change for positive social impact. 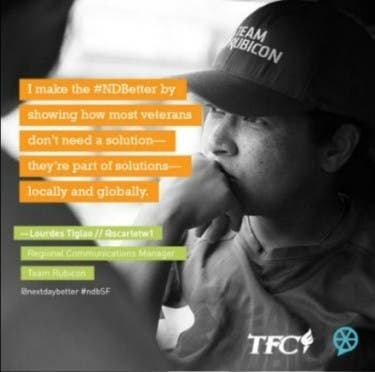 He was also the Founder and Chief Connector of Filamthropy, a social media campaign that recognizes and connects the Filipino “forces for good”. He is an Alumni Ambassador of The OpEd Project involving top universities, foundations, think tanks, non profits, corporations and community organizations, and is a Mentor at the Stanford Alumni Mentoring Program. LOURDES TIGLAO – as the Regional Communications Manager for Team Rubicon Region III and a medical volunteer, she was deployed most recently to respond to Typhoon Haiyan in the Philippines. Based in Washington D.C., she is a US Air Force veteran who served in the medical field as part of the three-person USAF Critical Care Air Transport Team and helped co-found and launch the first USAF Critical Care Medical Attendant Team in the Pacific. She was a member of the International Health Specialist Team for the US Air Force, an organization that used medicine as an approach to crossing cultural barriers. CHEF TIM LUYM – a chef, consultant and caterer of Chinese-Filipino-American heritage. He moved from Manila to the Bay Area when he was 3 years old. He was featured as a Rising Star Chef in 2007 by San Francisco Chronicle. A former partner and chef at Poleng Lounge, he has opened Attic Restaurant in San Mateo, along with several other culinary projects. 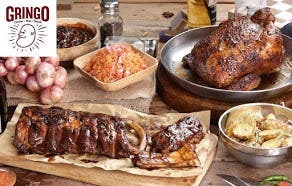 Attic has been recommended as a dining destination in the Bay Area by top food critics and bloggers. 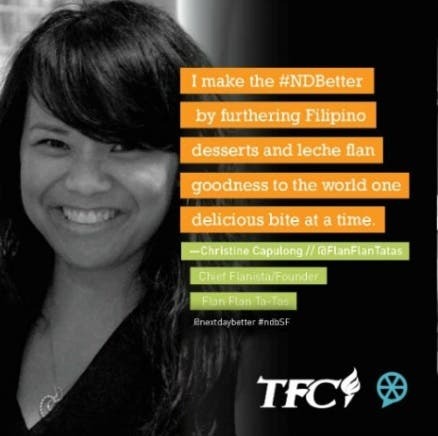 CHRISTINE CAPULONG – the founder and Chief Flanista of Flan Flan Ta-Tas! in San Francisco, a made-to-order gourmet dessert company specializing in leche flan, a caramel custard dessert. Behind it is a 40-year-old secret family recipe passed on from her grandmother. Her winning concoctions include unique flan flavors like Pumpkin Spice Flan and Chocolate Peppermint Flan plus best sellers Original Creme Caramel, Nutella Espresso Flan, and Coffee Flan. Joining them all with TFC are NextDayBetter Innovation and Design Strategist Renjie Butalid and Creative Director Cesley Musngi. TALK, EAT, THINK and DRINK with these amazing people. 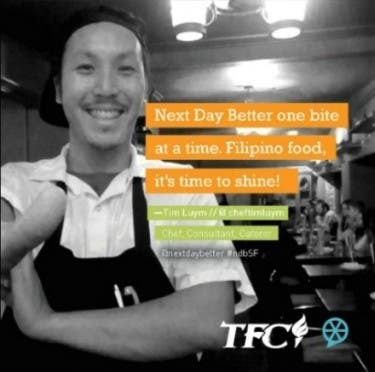 Register now for TFC Speaker Salon powered by NextDayBetter for FREE at http://bit.ly/TFCSpeakerSalon LIMITED SEATS ONLY.